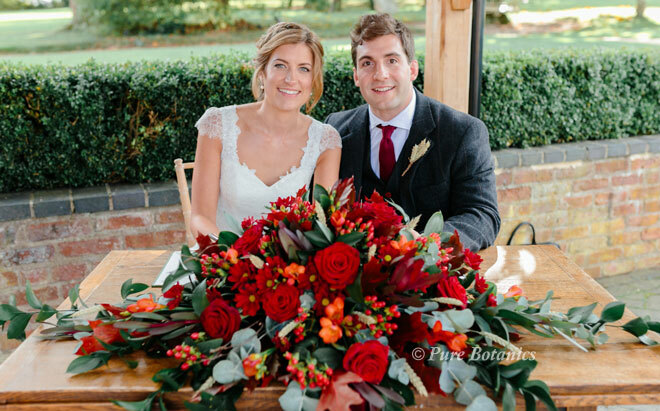 I love the rich reds and golden oranges of Jenny and Joe’s Autumnal wedding flowers. When I first spoke with Jenny she was passionate to create a country look to her wedding. 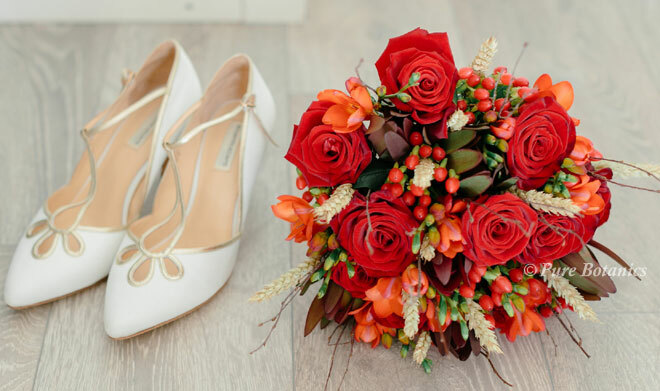 As the wedding was held in October Jenny wanted flowers and colours that reflected the season. They chose Wethele Manor for an outdoor ceremony with the beautiful Warwickshire countryside as their backdrop. You can see the couple here (above) at the end of the ceremony signing the registry. 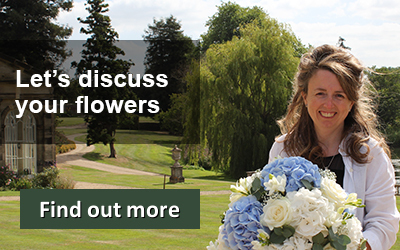 It’s a perfect choice of venue for a country style wedding and we have been supplying wedding flowers at this fabulous venue for over ten years. Planning an outdoor wedding is never easy in the UK but I was delighted when I arrived at Wethele to see the sun shining. The leaves on the trees were just starting to turn golden and everything came together beautifully. I created Jenny’s handtied posy bouquet with red ‘Grand Prix’ roses, red freesias that have a red and orange colour to them. Red hypericum berries and natural twigs were added to give texture and link with the Autumnal theme. To keep with the warm colour theme I added dark red leucadendron leaves. Ears of wheat were incorporated throughout the bouquet as Jenny had asked for this as they couple come from farming families. 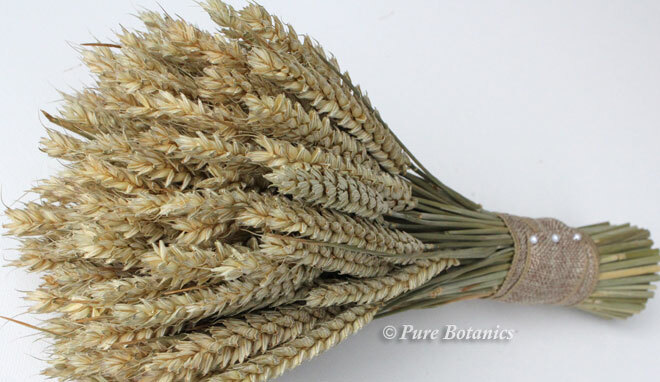 The wheat theme was then carried through to the gent’s buttonholes. Above you can see how I created a small cluster of wheat backed it with hessian and gave it a natural raffia stem. The orange buttons on Joe’s suit is such a great colour link to Jenny’s bridal bouquet. 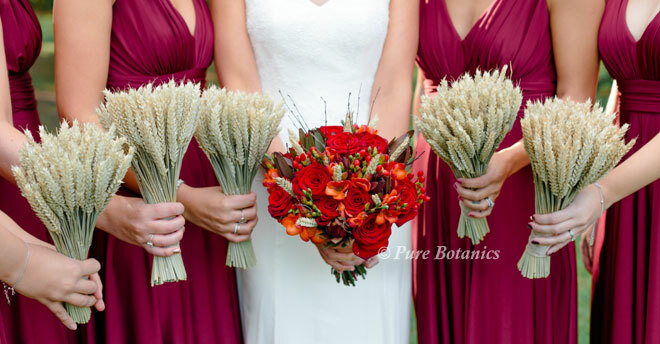 The bridesmaids carried handtied posy bouquets created from a spiral of wheat ears and finished with hessian ribbon handles. Jenny sent me a photo of a design she had seen and liked the idea of for her table arrangements. I slightly adapted it to create these stunning tall autumn inspired wedding centrepieces. 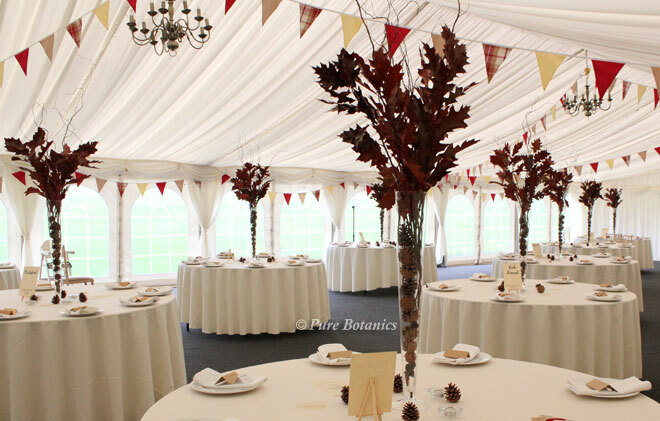 I love the blast of colour that these leaves give the marquee and they fitted in wonderfully with the bunting. I filled the tall vases full of fir cones and filled the vases full of the leaves and twigs and to finish scattered fir cones around the base of the vases. I was so delighted to receive the wonderful wedding photographs you can see here and I thoroughly enjoyed working on Jenny and Joe’s wedding. 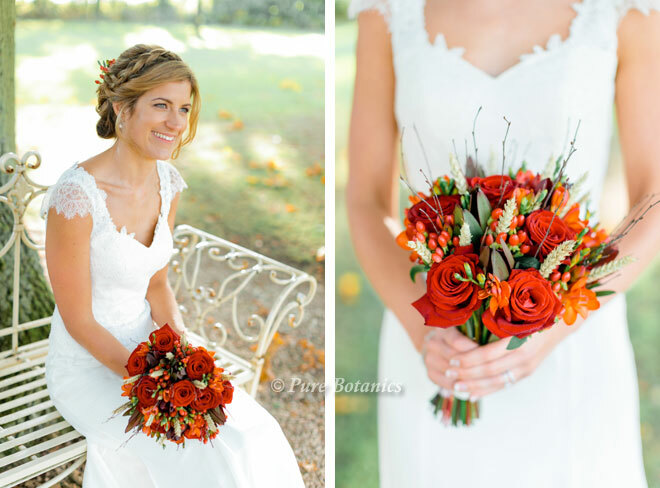 You might also like to see Lindsay’s Autumnal Wedding flowers from a few years ago she took the orange colour of autumn and put it together with green and purple. 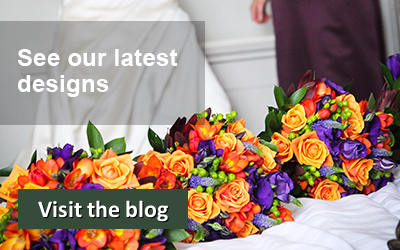 You can also see more of our beautiful red wedding flowers designs here.